It’s obvious to my friends and family that I am passionate about cooking. It’s also quite apparent that I am restless – always looking for a new recipe or adventure. I’m not a fan of repeating menu items over and over; trying out a new dish exhilarates me and keeps my creative juices flowing. But I’m only human. From time to time, even I tire of trying to decide what to cook. Last summer, when I was visiting my son in San Francisco, I was feeling a bit uninspired and decided to flip through a monthly publication. Lo and behold I stumbled upon the perfect solution to that night’s dinner – in a magazine ad of all places! There it was – an advertisement for Pompeian vinegar featuring a beautiful picture of a chopped salad. I was already a fan of Pompeian Red Wine Vinegar; it’s the brand I use most of the time because it’s less acidic and lends a nice mild flavor to salad dressings. 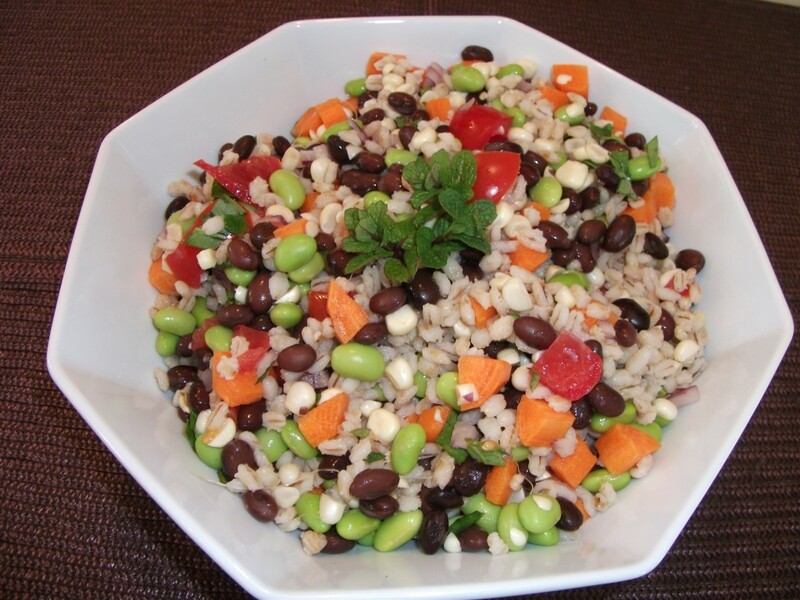 So I was thrilled to read about a healthy “Black Bean, Edamame and Wheat Berry Salad” featuring my favorite vinegar. Not one to follow recipes, I quickly reviewed the ingredients and started plotting how I would change it. My daughter-in-law Shira agreed to help me shop for ingredients so off we went in search of beans and grains and fresh vegetables – some of my all-time favorite salad components. We couldn’t find wheat berries at the nearby markets, but I substituted toasted barley. We found some beautiful corn and bright orange carrots and when we returned home I plucked some mint and basil from my son’s herb garden to toss in at the end. Then we got to cooking. I decided to make my own black beans, which you don’t have to do, but they are so much better than canned. Shira chopped and diced while I created the dressing and we gabbed away the entire time – catching up and enjoying our time together in the kitchen. I was happy to share a few tricks with her – like rinsing the diced onion in cold water to get rid of the bite and adding a healthy spoonful of Dijon mustard to the vinaigrette to punch up the flavor. My son hovered from time to time. At one point he expressed his reservations about the whole grains, wondering if people would really take the time to toast and cook barley. While I recognize that it takes a bit longer to prepare them, whole grains are a staple of my cooking and the texture, flavor and health benefits are worth the wait! The hearty salad that resulted from our afternoon in the kitchen turned out to be nothing like the original recipe. It’s healthy and filling and has countless possibilities if you want to try using different grains or beans or vegetables or herbs. My kids gobbled up two huge bowlfuls and made me promise to write down my interpretation before I left. And it’s become one of my favorite “go to” recipes. Rest assured, though, that I never make it the same way twice! Whisk together all vinaigrette ingredients and set aside. Note – there is probably more dressing here than what you ultimately need, so use the extra on roasted or steamed veggies or greens. This can be stored in an airtight container in the refrigerator for about 3-4 days. Bring water to a boil and add wheat berries. Lower heat and cook 45 minutes or until wheat berries are tender. If you are working with barley instead – put the barley in a dry fry pan over medium heat, keep stirring until it turns light brown and aromatic, approximately 4-5 minutes. 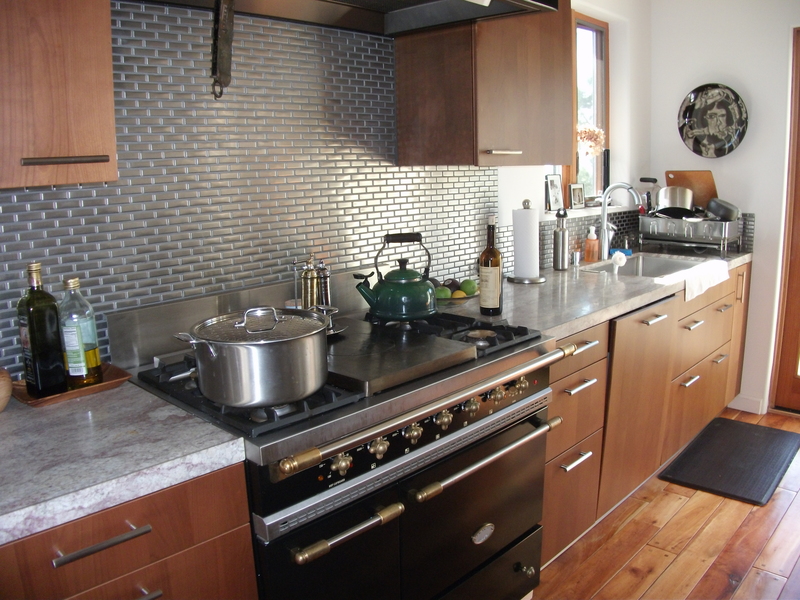 Note that barley cooks in less time – about 35 minutes. Drain and rinse well. Let sit in a strainer until no more liquid comes out and cool the grain to room temperature. Transfer to a medium bowl. If you want to expedite the cooling process – put it in the refrigerator. Once the grains have cooled, add the rest of the vegetables and stir. Refrigerate in a sealed container for up to 3 days without dressing. Add vinaigrette right before serving. Stir well, taste and add more dressing, salt or pepper to taste. This salad has endless possibilities. In addition to changing up the grains and switching out brown rice, quinoa, wheat berries or farro for the barley – feel free to experiment with different beans or lentils and various vegetables and herbs. Try yellow peppers in place of corn, blanched green beans in place of edamame, cilantro instead of mint. I use whatever’s in season and whatever speaks to me! This entry was posted in North America, Salads & Dressings and tagged Barley, Salad, Wheat Berries. Bookmark the permalink.